When I went to a Bloggers meet, I tasted a sandwich with fresh cucumber and tomato slices along with mayonnaise. But I felt something was missing. Later I had a green sandwich in a restaurant. 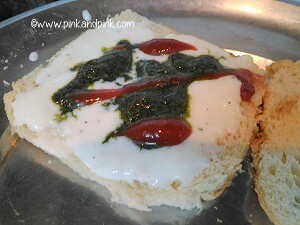 I realised that the sandwich served during the Bloggers meet would have tasted better if green chutney was added. I tried this sandwich the next day. But I was unable to post it immediately as I was busy with vacation. I have used sandwich bread this time. 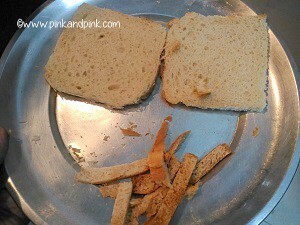 But I always use whole wheat bread mostly from BigBasket.com which does not have preservatives. Make fresh cucumber and tomato sandwich with wheat flour mayonnaise and green chutney. It tastes so yummy. Chop tomatoes and cucumbers into thin slices as shown in the picture in the next section. 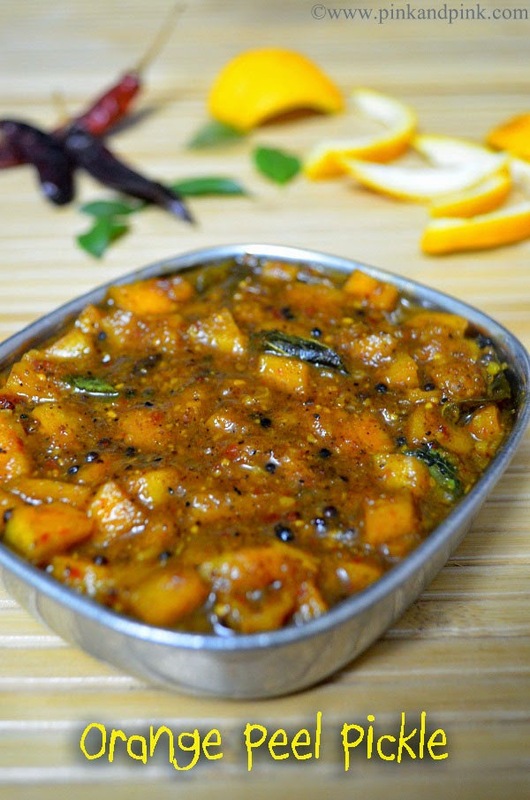 Let us make green sandwich chutney first. 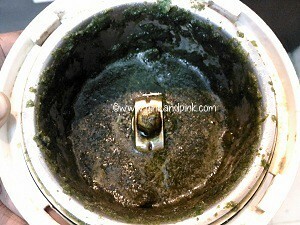 Grind 1/4 cup tightly packed mint leaves and coriander leaves, 1 tsp sugar and 1/4 tsp salt along with water and make a paste. It should not be too thick or too thin. We should be able to spread it easily on the bread. Our green chutney is ready. Keep it aside. 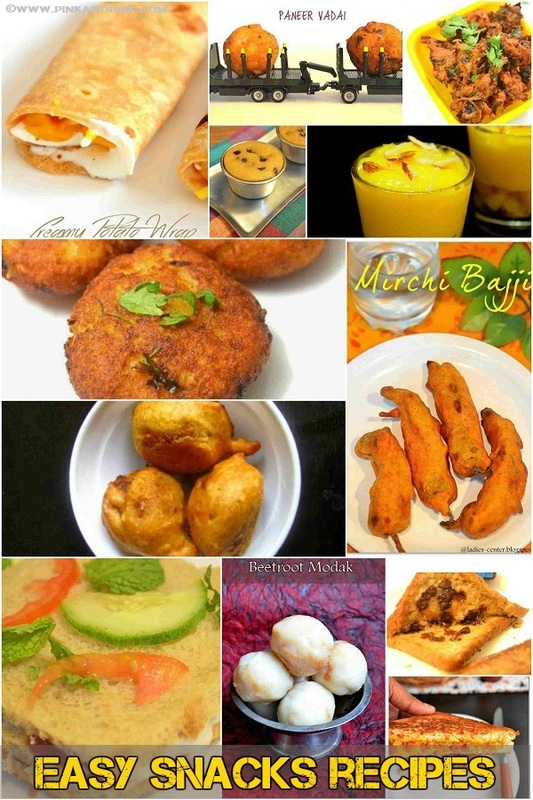 Let us make wheat flour mayonnaise now. 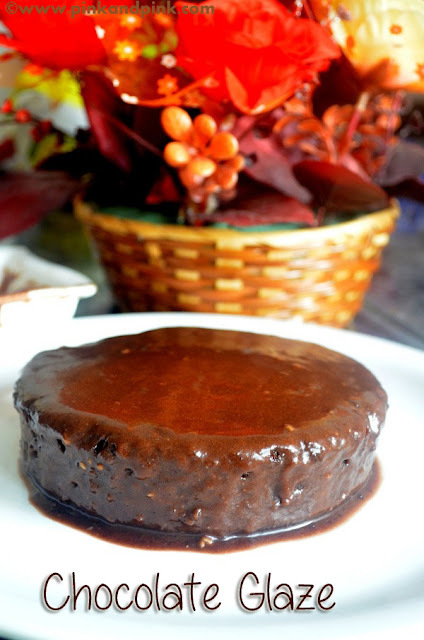 Mix 3 tbsp whole wheat flour with 1/4 cup milk. Make sure that there are no lumps. Heat a pan. 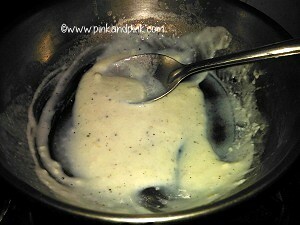 Add this mixture and remaining 1/2 cup milk. Add 3/4 tsp pepper powder, 1 tsp sugar and a pinch of salt. Stir continuously till bubbles start coming. Switch off the stove. Our wheat flour mayonnaise is ready now. Cut out the edges of the bread slices. 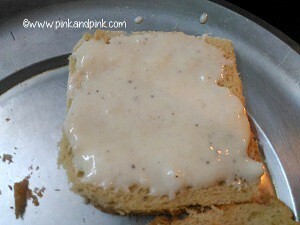 Take a bread slice and spread wheat mayonnaise generously with the help of a spoon. Spread green chutney as many as you like. Spread tomato sauce as much as you like. Place cucumber slices and tomato slices as much as you like. Close it with another bread slice. Repeat the same to make more Cucumber Tomato sandwich. 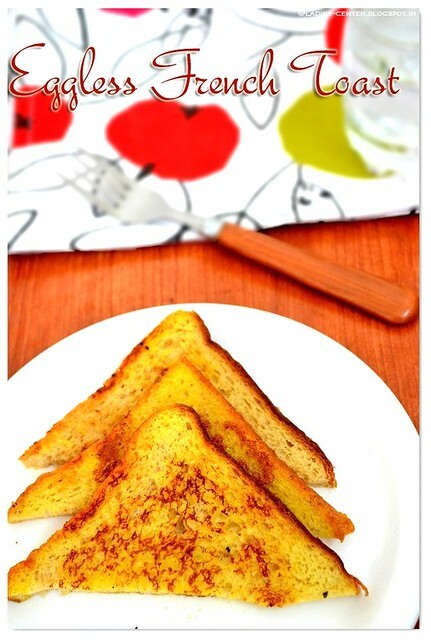 Now, let us see how to make Cucumber Tomato sandwich with step by step pictures. Chop tomatoes and cucumbers into thin slices as shown in the picture. 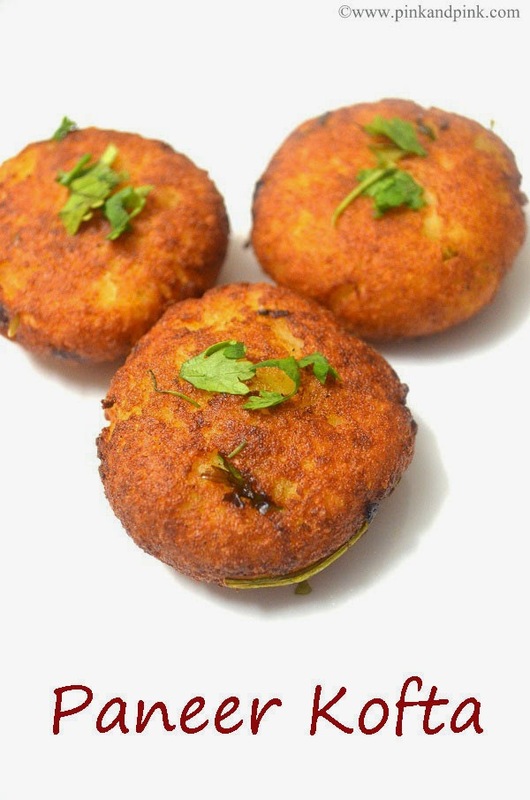 Spread green chutney as much as you like. Spread tomato sauce as much as you like. 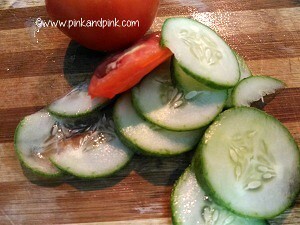 Place cucumber slices and tomato slices as many as you like. Close it with another bread slice. 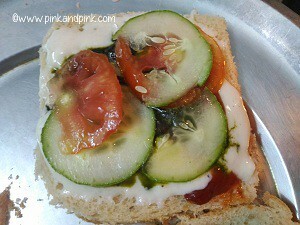 Repeat the same with other slices to make more Cucumber Tomato sandwich. 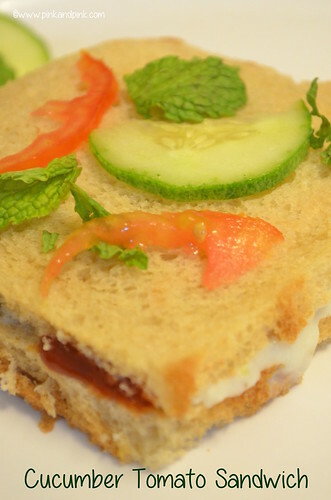 Cucumber Tomato Sandwich is healthy, yummy and creamy with wheat flour mayonnaise. 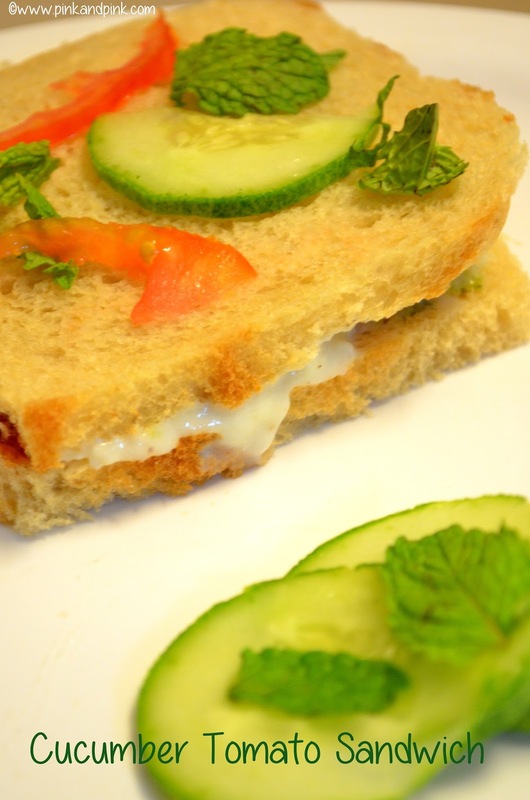 Try this Cucumber tomato sandwich recipe at your home to delight your kids.